I'm a bit surprised to find that this week's edition of The Sunday Mix is going to be the second to the last one for the year of 2016! It's honestly a bit mad how quickly time has flown by. But, that aside, come and check out this batch of interesting posts, videos and other stuff from all around the web. A quick note - If you happen to be hosting a 2017 reading challenge, or know of any that are going to be happening, I would love it if you tweet me a link or leave it in the comments section down below. That way I can include it in the final edition of this post for the year 2016 and alert my readers to all the fun stuff that will be happening. I get overwhelmed by my own TBR sometimes (it's composed of physical books or e-books that I've bought, review copies I received that are both solicited and unsolicited). Laura's reading epiphany has really inspired me to start thinking about my own reading goals for next year. I'm pretty good at stepping back and reading something that's just for me whenever I start to feel slumpy, but I want to make that more of a priority next year too - to read what I love or what I"m most excited about. I'm a pretty fast reader (definitely faster than most of the other people I know), but I still thought Hailey's video about how to read faster was really fun! It definitely has some easy tips to learn how to pick up the speed of your reading, and I think they could be helpful for you. Lauren tackles seasonal reading, particularly by detailing her own moods. I'm a pretty solid reader all throughout the year, but I really notice my gravitation towards specific genres in winter. I tend to be willing to invest more time in reading longer books during this time of the year. What about you? I had no idea that this documentary existed until just recently, but Love Between the Covers looks like it'll be really interesting and fun to watch! It features a few romance authors I've read (and really enjoyed books from), as well as other names that are familiar to me. I really think it would be fascinating to see what this documentary has to say about romance as a genre and an industry. I've started joining in on the seasonal book bingo challenges Bekka hosts, simply because I love the categories and I find the challenge of filling my bingo card up quite fulfilling. Here's the Winter 2016-2017 bingo card and sign-up post, so I hope you'll be joining in as well! 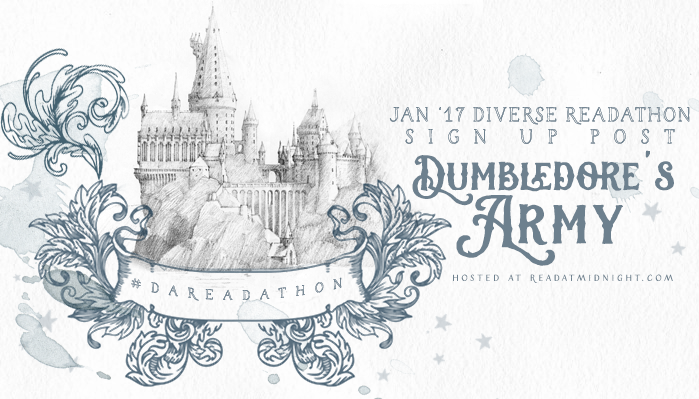 Among the many fun things I am doing in January, one of the most exciting is to be participating in the Dumbledore's Army Readathon hosted by Aentee. It's a Harry Potter-themed readathon (in case you couldn't already tell), and the focus is on diverse (especially #ownvoices) books. Happening from January 1-January 15, midnight to midnight wherever you are based in the world, you can definitely sign up to join me and many other readers. Plus, you can support your house by earning points (and how to do that is detailed in the sign-up post)! I'm planning to read The Sun is Also a Star, and for three different reasons. First, it's by an #ownvoices author. Second, I find Daniel's struggle to live up to family expectations but also stay true to himself something that I've experienced and know many people who have as well. And third, I also find Natasha's family's situation as they face deportation something I've had people I know experience as well. I meant to read this novel earlier this year, but I didn't get around to it, so I'm going to save it for this readathon. The book in question is If I Was Your Girl, which is also an #ownvoices novel. It features a transgender main character (and has a transgender model on the cover), and it sounds really, really good. I haven't read any (to my knowledge) novel featuring a transgender character, so I'm definitely excited to check this out. I could technically count either of the previous novels for this challenge, but since I feel like being ambitious, I thought I would choose a novel that has languished on my TBR for a while. I plan on reading More Happy Than Not for this one. I love Adam as a human being (he is one of the nicest, kindest people I have ever had the fortune to meet in real life), and I really do want to read his book (and his other upcoming title as well). This was the first prompt that I chose a book for, and the novel in question is A Room of One's Own. I have heard a lot about this novel (particularly on BookTube, as it was read for the Feminist Orchestra Book Club), and it certainly sounds like something I can very much sink my teeth into. Plus, it's by a well-known author that I've never read anything from before and I would very much like to remedy that in the new year. I feel like the moment I announce my book choice for this particular category, people are going to be "yelling" at me to read it right away. The book? Aristotle and Dante Discover the Secrets of the Universe. There is no question of how beloved this novel is all across the online book community, and I would very much like to read it and see what all the hype is about. I really hope that I enjoy it as much as everyone I know has! I am going to pretend that I did have a friend that personally recommended this one to me, but I'm going to go ahead and check out The Scorpion Rules. The premise of this one fascinated me the first time I heard of it, but I was hesitant because I'm not much for science fiction or dystopian fiction. However, I've been weirdly in the mood for that sort of read lately, so I'm definitely going to be checking it out in the hopes that I'll find it intriguing. Are you signing up for any 2017 reading challenges or readathons? Do you know of anything happening? Let me know in the comments!